In May, admist a sporadic rhythm of ongoing construction, the 2014-2015 class of UNT Leadership Fellows took an extensive look inside of our university's Union, which has been under construction for nearly two years. Among the group were Leadership Fellows Sian Brannon, Brian Richardson and Stephen Austin, as well as Interim Vice Provost for Academic Affairs Christy Crutsinger. 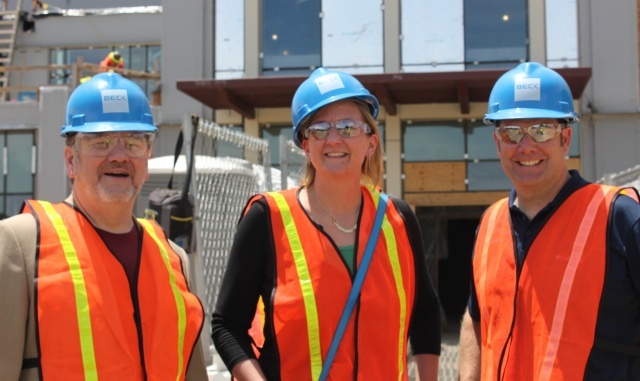 Donning hard hats, they learned about the new building and its many amenities: diverse food venues, a sizable bookstore, spacious room for student activities, and so much more. "It's truly a full-service, all-encompassing student gathering and engagement locale," said Brian Richardson. Aside from touring the Union, Leadership Fellows collaborate monthly to learn more about UNT, discuss situations they encounter, work on the development of leadership skills, attend professional conferences together, and interact with UNT's leaders. This year's cohort attended the Academic Chairperson's Conference in Austin, Texas, had breakfast with UNT President Neal Smatresk, toured Discovery Park, met and learned from Walt Gmelch (author of numerous books on leadership and leadership skills important at a university), and much more. "Having breakfast with the President was especially enlightening," said Sian Brannon. "(It) gave us some insider perspective into his mindset. We learned that he isn't as interested in one's leadership style, per se, as he is with leaders being actual leaders - motivating others to get things done, and being willing to try even with the option of failure. With that in mind, the Fellows can be more effective in aligning department goals and priorities to Neal's ideals." Concerning Leadership Fellows' effectiveness in helping its members grow and connect, Brian Richardson noted that "a prime benefit of the program is the networking with other campus leaders. We learn about ways we handle challenges, generate creative ideas, improve our departments, and that we are not alone in these endeavors." The Leadership Fellows program is just one of UNT's many programs for faculty development. For more information, visit our website. Please contact your dean or department chair if you are interested in becoming a Leadership Fellow! The deadline for nominations for the 2015-2016 class of UNT Leadership Fellows is August 21, 2015, and candidates must be nominated by their dean. Regents Professorships provide recognition for faculty at the rank of professor who have performed outstanding teaching, research and service to the profession, and who have achieved a high level of national and international recognition. The Board of Regents has approved two new Regents Professorships for 2015. Congratulations to our Newly Promoted and Tenured Faculty! UNT's success and progress depends on the exceptional work of our faculty members who set high academic standards and perform at the 'top of their game' in their teaching, research, and service endeavors. The culmination of their hard work is the receipt of tenure and/or promotion. We congratulate the 80 UNT faculty members who will begin the 2015 academic year with a promotion in rank, newly granted tenure, or both. Please join us as we celebrate their accomplishments and that of other UNT faculty during Salute to Faculty Excellence Week, September 28 - October 2. Events will be held across campus to showcase the dedication of UNT faculty to teaching, research and service. The university celebration will culminate in the Salute to Faculty Excellence Awards Dinner and Ceremony on October 2, 2015. At this Green Tie Affair, we will honor UNT Award Winners and newly promoted and tenure faculty. Information on how to register will be available on our website in July. As of March, the College of Education has proudly announced that it has a new Associate Dean for Academic Affairs: Dr. Bertina Hildreth Combes. 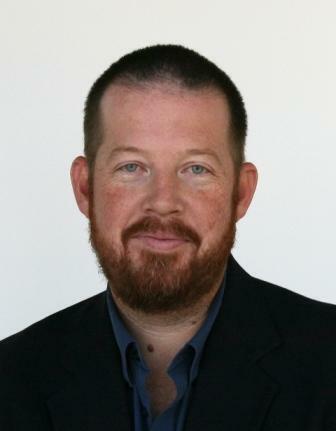 In addition to pursuing research interests that include educator preparation, transitioning of students with disabilities into a post-secondary setting, and issues related to diversity in education, "Dr. Combes has excellent skills for leading as associate dean, including grant expertise, mentoring students and faculty, and curriculum development," said Dean Jerry Thomas. "I am delighted that she has agreed to serve the college and UNT in this important role." Combes herself said that she "look(s) forward to promoting our college... it is exciting to be at UNT and I am committed to being fully engaged here in the college and university." 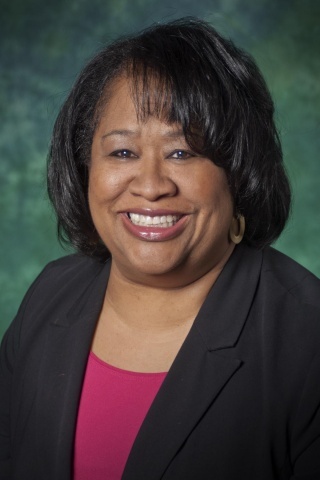 After working at UNT for sixteen years, holding the position of Associate Dean for Educator Preparation and Academic Affairs for the College of Education, and serving as coordinator for special education programs from 2002 to 2009, Dr. Combes assumed her new duties on June 1, 2015, and we look forward to the impact she will have on UNT's continued success. From a nominee pool of more than 600 artists, Dornith Doherty, a Distinguished Research Professor in the Department of Studio Art, has received Texas' highest recognition for excellence and dedicated commitment to the arts. Doherty has been awarded the Texas State Legislature's 2016 appointment to the position of State Two-Dimensional Artist. 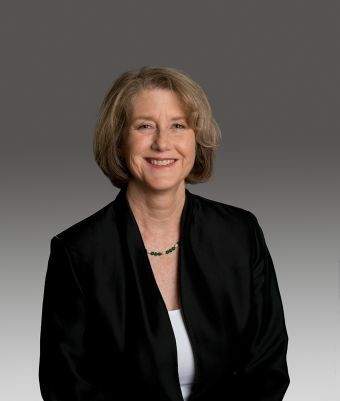 Her areas of expertise have included contemporary photography, digital imaging, large format photography and analog photography, and her work has included projects focusing on landscape stewardships and genetic resource preservation. "I am fascinated by photography and its poetic realism," said Dornith. "It still amazes me that I make art by capturing light rays radiating off my subjects. The metaphoric qualities of photographic images captured my attention from the start, and I've photographed seriously from that moment on." Dornith Doherty was a 2012 Guggenheim Foundation Fellow, and has received grants from the Fulbright Foundation, the Japan Foundation, the Society for Contemporary Photography, the Indiana Arts Commission, and the United States Department of the Interior. Her work has been featured in exhibitions all over the world. More information about Dornith and her extensive artwork can be found on her website. Summer is a great time to pursue new and enhanced training opportunities! Below are links to a wide variety of online venues for teaching development and technology. The National Endowment for the Humanities (NEH) is accepting applications towards its Summer Stipends Program for projects beginning May 2016. With an internal deadline of July 15, 2015, this $6,000 award supports individuals pursuing advanced research that is of value to humanities scholars, general audiences, or both. Typical outcomes include articles, monographs, books, digital materials, archeological site reports, translations, editions, or other scholarly resources. The stipend support projects at any stage of development and continuous full-time work on a humanities project for a period of two consecutive months. For more information about the program, award eligibility, application procedures and more, please visit our website here. This summer, UNT is piloting a new instrument for the student evaluation of teaching, IASystem. This instrument, developed and delivered by the University of Washington, offers many of the benefits that faculty desire including customized surveys for different instructional formats, quick reporting features, the opportunity to add instructor questions, a transparent scoring system, and dashboard monitoring. The Student Evaluation of Teaching Task Force will evaluate the pilot in August and make a recommendation soon after. Please note that during the pilot this summer, there will be no SETE administration to prevent survey fatigue. We encourage you to visit the IASystem website to learn more about the survey. If you have any questions, concerns, or good ideas, please email evals@unt.edu. As thousands of new students, freshman and transfer, step onto UNT grounds for the first time this fall, many will arrive on our campus with little knowledge of what to expect from university life. Over 5,000 of these new UNT students are expected to be at Student Convocation, which provides them with a formal welcome and sets the tone for their academic life at UNT. Faculty presence at Convocation symbolizes the centrality of scholarship to the university experience. 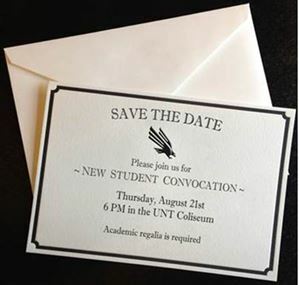 Please support the Class of 2019 and make plans to attend Student Convocation on Thursday, August 20, 2015 at 4:00 p.m., at the UNT Coliseum. Business casual attire is appropriate (regalia not required) for this event. As always, we are also eager to hear of your good ideas, comments, and/or suggestions for the next Faculty Newsletter. Feel free to e-mail us anytime!